Deciding which type of image to use can seem overwhelming for most people, but there are simple ways to tell the difference and discern which image you should use for which type of project. Almost every digital image can be placed into one of two categories, Bitmap Images (also known as Rasters) and Vector Graphics. An easy way to think of bitmap images is they are generally digital pictures or scanned images. Drawings made in Adobe Illustrator, Corel Draw, or Inkscape are saved as Vector Graphics. 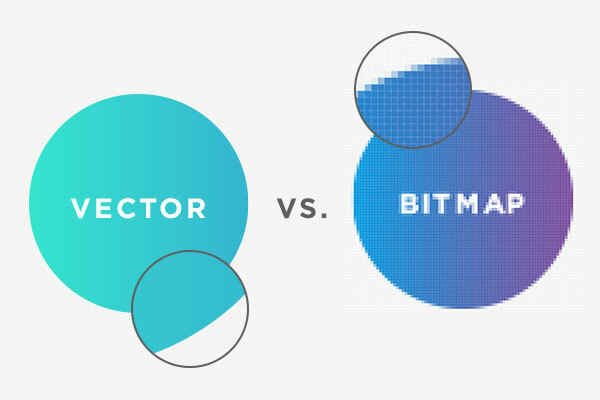 Bitmap is mostly used to represent real life, where vector is generally used for more abstract images such as logos. The two formats are very different but the end results can, at times, be made to look similar; an abstract bitmap or a realistic looking vector is not uncommon. Bitmap images are what most people think of when they think of a digital image. They are made up of a collection of bits that make up an image. If you have ever zoomed in on a photo to the point where it looks like a bunch of squares then you have seen a bitmap image. 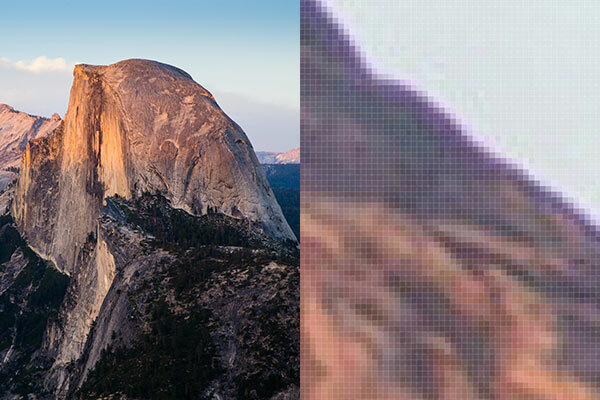 Below is a bitmap image with a magnified section to show what we mean. Bitmaps are larger than their vector counterparts, which along with the loss of image stability when zooming in are two of their main disadvantages. They are however a much simpler output and easier to create for the most part. Typical file formats of bitmaps include: bmp (outdated), eps, gif, jpg, pdf, psd, tiff, and png. 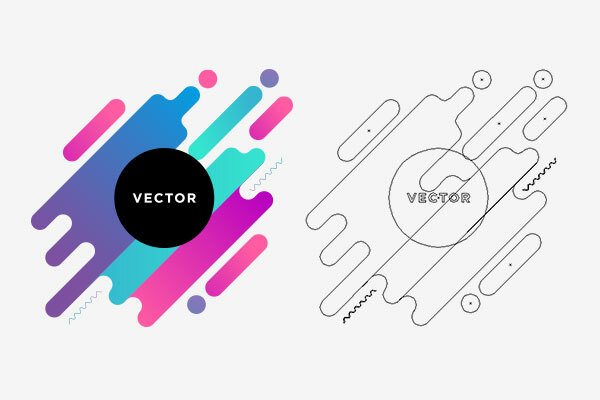 Vector Graphics are completely made up of mathematically defined points and interactions. Each line is made of either a collection of points with lines connecting all of the points, or a few control points connected by Bezier Curves. Most vectors use the latter method as it creates smaller file types and smoother looking images. Below is a vector image with the lines that make up the image beside it. Vector drawings are generally smaller files because they only contain data and not full images. Vector drawings can also be scaled without losing any quality, which makes them ideal for company logos or other objects that need frequent resizing. They are much more difficult to output especially if you have many small objects included in your drawing. Hopefully these tips will help you decide which image is best for your needs, whether you are designing a Custom Patch, a Custom Label, or even a Temporary Tattoo it is always good to use a vector when possible, that way you can scale the size if you need the same image on a Window Decal for a giant window and a Custom Patch for a uniform at the same time. Of course at StickerYou we can deal with any image type so feel free to upload your image in your format and we will make your message stick. Any size, any shape, any quantity.